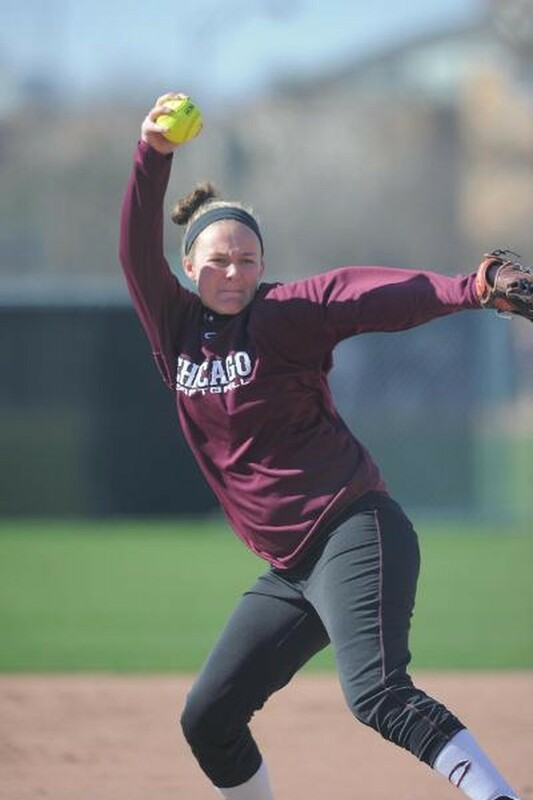 Fourth-year softball star Jordan Poole is approaching her final days on the mound for the Maroons and is certainly going out in style. The pitcher set records just last week, throwing a no-hitter against Hope College to lead UChicago to victory. Even more impressive was that the no-hitter was not her first: she also allowed no hits against Carthage College on March 23, 2014 in her sophomore season. At the end of her third year, with still one full season to play, Poole ranked eighth in the UChicago record books for her 30 career wins as a pitcher and seventh for 267 career strikeouts. Poole’s status throughout her senior campaign has only improved and she will soon leave Hyde Park as one of UChicago’s most accomplished pitchers to date. Speed has definitely not held her back as a collegiate softball player, as she made an immediate impact on the program upon her arrival to the South Side. In her rookie campaign, she started 15 out of 16 games pitched, striking out 79 batters in 89 and two-thirds innings played. Her productivity was not limited to the mound, as she had a 0.302 batting average, one home run, 13 RBI, and a team-best 15 walks in her first year wearing maroon. From there, Poole continued to improve. In her second year, she compiled a 15–5 record with four shutouts, a no-hitter, and 119 strikeouts in 128 and one-third innings. Her performance landed her a UAA Athlete of the Week Honor, as well as NFCA Third Team All-Region recognition. In her third year, she started 15 out of 17 games and pitched 69 strikeouts, earning her UAA Pitcher of the Week status. Her goal for this year’s squad just may come true, as the team now boasts a winning record of 20–6, on the path to be UChicago’s best team in Poole’s four years. Additionally, the Dean’s List student earned UAA All-Academic honors in all three years that she was eligible. Poole is also a student in the M.A. Program in the Social Sciences (MAPSS), a one-year selective program offered at the University for students concentrating in anthropology, economics, history, political science, psychology, sociology, or in interdisciplinary research. Currently, Poole is working on finishing her M.A. in the MAPSS program, in addition to writing her B.A. Her M.A. thesis is on Iraqi refugee admissions after September 11, 2001. After graduation, Poole will continue working for Stratfor’s security team, doing research and analysis on terrorism and organized crime. She will spend most of the year abroad, traveling from Indonesia to Kenya, in order to gain more international experience while working full-time.